Leo John Meyer was born on October 6, 1917, in New York City. He joined the New York State National Guard as a Cadet in 1935, and drilled with the 101st Cavalry in Brooklyn and played the field drum in the 102d Engineer Regimental Field Music before enlisting in the New York National Guard on November 15, 1937. Cpl Meyer served with the 102d Engineer Regiment of the 27th Division of the New York National Guard from November 1937 until his unit was called to active federal service on October 15, 1940. He then served as a Clerk and Supply Sergeant with Company B, and as a Regimental Message Center Chief and Regimental Sergeant Major with Headquarters, 102d Engineer Regiment at Fort McClellan, Alabama, from October 1940 to December 1941. Sgt Meyer next moved with his unit to California from December 1941 to March 1942, and then deployed to Hawaii in May 1942. MSG Meyer then returned to the United States and completed U.S. Army Air Forces Officer Candidate School in Miami Beach, Florida, earning his commission as a 2d Lt on March 3, 1943. Lt Meyer served as Director of Training with the 26th College Training Detachment at Mt Union College in Alliance, Ohio, and then as Adjutant of the 2512th Army Air Forces Bombing Unit at Childress Army Air Field, Texas, before transferring to the Infantry as a 1st Lt on February 2, 1944. After completing the U.S. Army Infantry School, he served as Executive Officer of Company D, 60th Infantry Replacement Training Center at Camp Blanding, Florida, before serving in combat as a Platoon Leader and acting Company Commander of Company A, 1st Battalion, 34th Infantry Regiment of the 24th Infantry Division on Mindanao in the Philippines. After the war ended, he served with his unit on occupation duty in Japan until leaving active duty in May 1946, serving as a Master Sergeant in the Army Organized Reserve Corps until returning to active duty in June 1947. Lt Meyer again attended the U.S. Army Infantry School in 1948, and then served with Headquarters, 1st Battalion, 7th Infantry Regiment of the 3rd Infantry Division at Fort Devens, Massachusetts, from 1948 to 1950. His next assignment was with 3rd Battalion and Headquarters, 7th Infantry Regiment of the 3rd Infantry Division in Korea from November 1950 to May 1951, followed by service with the same unit back at Fort Devens until 1952. Maj Meyer served as an Active Duty Army Liaison with the Massachusetts Army National Guard in Quincy, Massachusetts, from 1952 to 1955, and then served with the Community Support Office in the U.S. Army in Europe Sub Area of Bad Kreuznach, West Germany, from 1955 to August 1958. He served with Headquarters, U.S. Army Disciplinary Barracks, New Cumberland General Depot, in New Cumberland, Pennsylvania, from August 1958 to March 1959, and then with Headquarters U.S. Army Training Center (Infantry) at Fort Dix, New Jersey, from March 1959 to March 1961. In order to remain on active duty, he reverted to his reserve Warrant Officer rank of CWO4, and changed his service branch from Infantry to the Intelligence Corps. After attending the U.S. Army Intelligence School at Fort Holabird, Maryland, CWO4 Meyer served as an Intelligence Officer with the Intelligence Corps Field Office, 1st Army Support Group, in New York City from January to July 1962. His next assignment was with the Intelligence Corps Field Office, 108th Intelligence Group at Camden, New Jersey, from July 1962 to June 1963, followed by service with Headquarters, 401st Intelligence Corps Detachment in Honolulu, Hawaii, from July 1963 to July 1966. CWO4 Meyer served with Headquarters, 116th Military Intelligence Group in Washington, D.C., from August 1966 to November 1968, and then with the 5th Mobile Strike Force and with Headquarters 5th Special Forces Group in Nha Trang, South Vietnam, from December 1968 to November 1969. He then served for a brief time with Headquarters, 119th Military Intelligence Group at Fort Mead, Maryland, before serving with Headquarters, 116th Military Intelligence Group back in Washington, D.C., from February 1970 until his retirement from the Army on April 1, 1971. 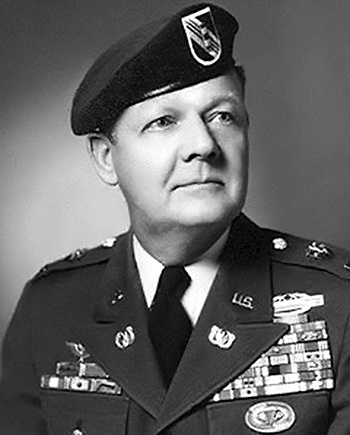 While on active duty from 1961 to 1971, CWO4 Meyer was concurrently promoted through the commissioned ranks to Colonel in the U.S. Army Reserve, retiring at that rank in 1971. Leo Meyer died on January 12, 2006, and was buried at Arlington National Cemetery. Col Meyer was inducted into the U.S. Army Officer Candidate School Hall of Fame at Fort Benning, Georgia, on March 27, 2009.